Listen to tracks from the Album: Click on a title to begin playing that track. Producer Lauren Busch Singer Interviewed by Preschool Entertainment.com reveals a behind the scenes look at the recording and production of Funky Kidz! Check out the whole interview here. This kid is NOT messin around! Get Funky wit' it! FUNKY KIDZ was voted 2009 Album of the Year by Creative Child Magazine!! A fun-filled musical journey for the whole family! This musical recording is a compilation of classic children’s songs, familiar to both kids today and parents of yesteryear. The songs are meant to invoke happy memories of childhood for everyone, while exposing children to the funky, high-instrumentation sound that oozes out of the Crescent City. As a funky mother of two, I was disappointed by the offerings of children’s music and set out to expose my kids to a variety of musical genres. From the time they were in my belly, I played everything from hard rock to classical ballads. My sons, Jake, 9 (assistant producer) and Aidan, 5, took a love to New Orleans funk and so the concept was born… take kids songs and just make them funky. So here it is. . .play it in the car, at home or wherever you want and jam out with your children; they’ll love it and trust us, you will too! Ingrid Lucia's "This Little Light of Mine" featured on Ellen Degeneres! 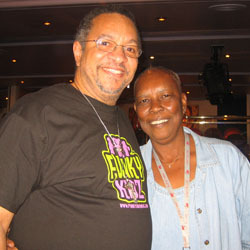 On November 10, 2009 The Ellen Degeneres Show featured "This Little Light of Mine" by Ingrid Lucia from the New Orleans compilation FUNKY KIDZ. We love the funky album and will definitely get around to playing most every tune on it! It's fantastic!! GREAT work! With a New Orleans sound, Funky Kidz offers a new take on some classic children’s tunes. It’s the type of CD that you’ll be listening to even after the kids have gone to sleep or left for school. "Their swinging melodies full of expression and energy get you on your feet, dancing up a storm and singing along all the while. Truly a spicy feast for little (and big) ears, listeners can hear the New Orleans roots in each rendition, the blaring brass pieces intermixed with more funky, modern styles and distinctive rhythms throughout." "Let me put it simply, Funky Kidz is excellent music: danceable, funky, complex, and utterly jazzy. It’s as good as anything I might listen to while the kids are at school. The fact that I can put it on while they’re in the house or car with me is a bonus. The additional neurons and musical sensibility they’ll grow from listening to such musically astute stuff is icing on an already rich cake." "Did I mention that this Kids CD is Fun?? Hehe. What else could possibly describe this great children's CD! Think laughing, clapping, smiling, dancing and twirling, and good old silliness. That is exactly what Funky Kidz is all about." Enter to win a free copy of FUnky Kidz by visiting Happy Healthy Families and leaving a comment about your favorite song from the album! "Mommy, watch me dance!" Lily is quite the performer these days. She is taking both dance and cheerleading classes, so I think she has rhythm flowing through her veins! So, music reviews are always a favorite in my house! This CD was a total HIT! Lily danced to the entire album and completely wore herself out before bedtime (a definite plus! LOL!). Check out her funky moves as she does the Hokey Pokey! Want to get Funky with some new CD's?? One lucky winner will receive a copy of EACH CD! Simply listen to the tracks, and then visit this page and post your favorite! You can also enter via Twitter - follow the instructions from the above page. Thanks! This recording is about family fun, and the special bond that great music creates between people. It is meant to serve as a conduit between the adult ear and the newly exposed listener. Thanks so much for the prize! My great-niece, Olivia Flor Delgado, who lives in Houston, is 7 yrs. old, just got her 1st guitar for Christmas, and is taking guitar lessons. She is in her 5th year of dance lessons (started when she was 3). She loves music and dance more than Barbie dolls or Dora the Explorer. This CD will be a treasure for her, I'm sure, as she is indeed a Funky Kid. I wanted to thank everyone at the station who helped make this interview a success! We appreciate your hard work and dedication to promoting great music! Thanks! Check out this great new interview with the guys from Dumpstaphunk - Features a great shoutout to Funky Kids! 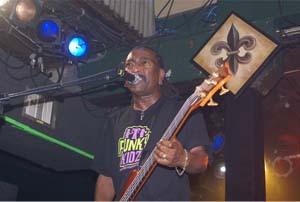 Nick Daniels from Ivan Neville's dumpstaphunk playing at Tipitina's and wearing our shirt. Funky Kidz brings local NOLA artists together on one incredible kid and adult friendly album that everyone can enjoy on that long summer road trip or even running quick errands around the city. Local artists include Bonerama, The Radiators, Ivan Neville & Dumpstaphunk, Walter “Wolfman” Washington and the Roadmasters, Johnny Sketch & The Dirty Notes, Amanda Shaw & The Cute Guys, Ingrid Lucia, Paul Sanchez, Theresa Anderson, Papa Gros Funk, George Porter, Jr., and more. Mark Mullin’s and the gang in Bonerama start’s things off right with big brass sound in their version of “You’ve Got A Friend In Me.” The Radiators make Froggy one cool toad in their rockin’ blues version of the classic folktale “Froggy Went A Courtin.” Mr. Paul Sanchez and the lovely Theresa Anderson redefine the Americana classics of Somewhere Over the Rainbow, with Anderson belting out a beautiful version of the title song, and Sanchez playfully taking over the role of the Scarecrow in “If I Only Had A Brain.” Big Sam’s Funky Nation puts their personal spin on “Hokey Pokey,” that will truly have you shaking it all about, while Ivan Neville’s Dumpstaphunk plays a lively silly hearted version of “Zip A Dee Doo Dah.” With masses of laughter and happiness from little ones, Funky Kidz truly scores high on family fun making it a perfect CD to give or take anywhere.. "...Earlier this year, Singer, of North Miami Beach, produced Funky Kidz, a collection of classic children's tunes interpreted by an elite group of Crescent City musicians. With contributions from bands such as Bonerama, Papa Grows Funk and Johnny Sketch and the Dirty Notes, as well as legendary artists Walter "Wolfman" Washington and George Porter Jr., Funky Kidz boasts sizzling grooves; umbrella-raising, second-line rhythms and more brass than a meeting of Pentagon generals." Kiddo Music Store & © 2008 ASAP PRODUCTIONS INC. All Rights Reserved. Unauthorized reproduction is a violation of applicable laws.